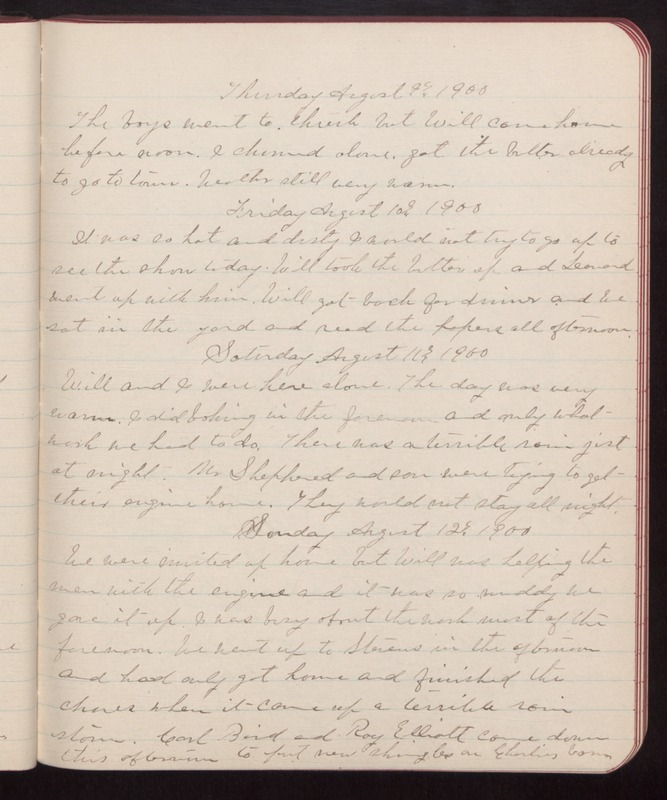 Thursday August 9th 1900 The boys went to thresh but Will came home before noon. I churned alone. got the butter already to go to town. Weather still very warm. Friday August 10th 1900 It was so hot and dusty I would not try to go up to see the show today. Will took the butter up and Leonard went up with him. Will got back for dinner and we sat in the yard and read the papers all afternoon. Saturday August 11th 1900 Will and I were here alone. The day was very warm. I did baking in the forenoon and only what work we had to do. There was a terrible rain just at night. Mr Shepherd and son were trying to get their engine home. They would not stay all night. Sunday August 12th 1900 We were invited up home but Will was helping the men with the engine and it was so muddy we gave it up. I was busy about the work most of the forenoon. We went up to Stevens in the afternoon and had only got home and finished the chores when it came up a terrible rain storm. Carl Bird and Roy Elliott came down this afternoon to put new shingles on Charlies barn.